Iron is a mineral that helps build red blood cells. 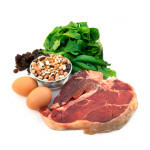 Good sources of iron include red meat, eggs, poultry, fish, legumes (or beans), fortified cereals, and leafy greens. If you don’t have enough iron, you can become anemic, leaving you feeling tired and weak. Iron is a mineral that helps build red blood cells. Most importantly, iron helps your blood cells carry the oxygen, which is needed for energy, throughout the body. Getting the right amount of iron can improve your performance in sports and in school. People who follow a vegetarian or vegan diet need to pay extra attention to make sure they get enough iron. Iron deficiency can cause a condition called anemia. Iron deficiency anemia occurs when you don’t have enough healthy red blood cells because your body does not have enough iron. Without the right amount of healthy red blood cells, your body’s muscles and organs won’t get the oxygen they need. This can cause people with iron deficiency anemia to look pale and feel weak and tired. Not getting enough iron in your diet or losing too much iron from heavy menstrual periods are the most common causes of anemia. Your health care provider may recommend a multivitamin with iron if it seems like you are not getting enough iron from foods. If you are already anemic, your health care provider will probably suggest an iron supplement. If you take a calcium supplement, try not to take it at the same time as your iron supplement because your body absorbs these nutrients better when they are taken separately. For example, take one supplement in the morning and one with dinner. Avoid caffeine (for example soda, black tea, or coffee) when taking an iron supplement. Caffeine, as well as tannins found naturally in both coffee and some teas, can interfere with iron absorption. Remember: Try to include iron-rich foods in your day to keep your body healthy and prevent anemia. I read that taking birth control pills can help lower the risk of getting anemia. I have already been diagnosed with iron-deficiency anemia; will going on the pill help?